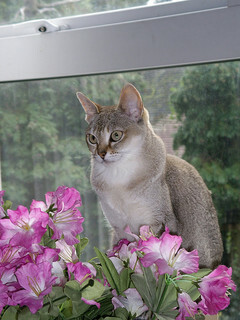 The smallest domestic cat breed is the Singapura. Singapuras were originally known as “drain cats” in Singapore (where they originated) because ferals often sought refuge in storm drains. Once considered pests, these tiny cats are now very popular throughout Europe and North America. The following weight ranges for the 12 smallest cat breeds, which are in pounds, represent an average that includes both females and males. Males typically weigh more than females, so females will usually be at the lower end of the range and males at the upper end. Teacup Persians and Himalayans are much lighter than typical Persians and Himalayans, weighing in at 2-6 pounds on average, with the males usually a couple of pounds heavier than the females. Teacup cats are not a separate breed, but rather a variant of existing breeds created by selectively breeding only very small Persians and Himalayans. For answers to more cat questions, visit the Cat Facts Page. For more cat breed articles, visit the main Cat Breeds page. For a full list of cat articles, see the main Cats page.